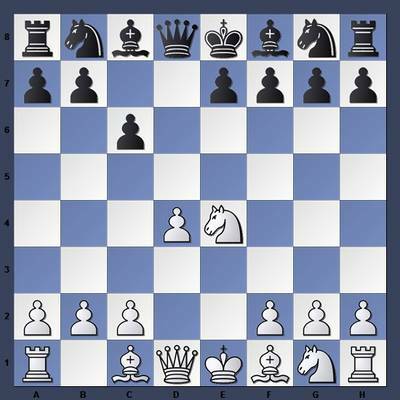 These are the initial moves where both Black drives a wedge between the White pawns early on. The game progresses rapidly with knights and bishops taking control over the center. The game progresses as it should be with both Black and White taking chances to win control. The game gains pace now as the Black queen comes in to action and makes White tremble and suffer a lot for its wrong moves. Now the game changes equally White cleverly makes some moves which to regain control over proceedings. At this point both take great chances of acclaiming the control one over the other and both sides lose material. Now the game entirely changes and Black gains the upper hand by making witty moves. After these moves White comes entirely under control Black who finally wins the game. Play through my game here. Join in and write your own page! It's easy to do. How? Simply click here to return to Albin-Counter Gambit Cliff-Hangers. d4 d5 and c4 e5 and usually its continuation is dxe5 d4. This opening is usually done against the Queen’s Gambit. It was initially performed by Cavallotti. It was against Salvioli at the Milan tournament of 1881. In New York, 1893, this opening was tried by Adolf Albin against Lasker and from that incident, it was known as Albin-Counter Gambit. It is not a usual practice in master level, but Russian Grandmaster Alexander Morozevich has made so many successful uses of this opening. In the Encyclopedia of Chess Opening, this version of chess opening is usually coded as D08 and D09. Play through the moves of this fine game and don't be too hard on Albin for not beating Lasker.